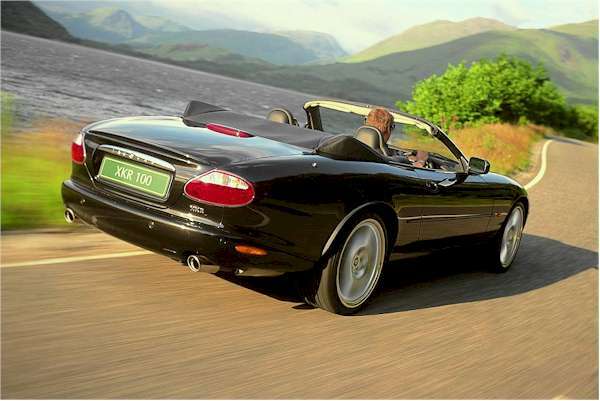 The original XK8 was launched in 1996 as a convertible or coupe. Equipped with the all new 290hp aluminum V8, 5 speed automatic transmission, and 17" wheels, the successor to the XJS was very well received by enthusiasts and the press alike. The all curve styling was very different from the XJS but brought back memories of the E-Type. As all Jaguars, the XK8 pampers the driver and his passenger with Connoly leather, rich wood veneers and all the comfort expected. On the performance side, the 290hp engine provides plenty of power giving the XK8 performance similar to the Mercedes SL500. The ride is more precise than the XJS predecessor but still offers the qualities expected from a Jaguar. When it was introduced, the XK8 was the first car totally designed and conceived following the Ford take over in the late 80s. Until then, Jaguar had a serious image problem with poor reliability, something which had been improving steadily since the Ford take over. The XJ6 sedan, largely redesigned in 1995 was the first car to benefit from Ford large investments and the XK8 turned out to be a well engineered and reliable car. 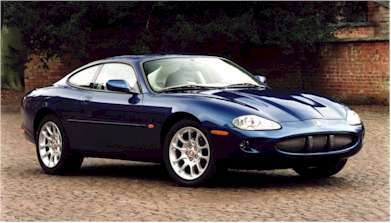 This recovery peaked in 1999 when Jaguar took coveted 1st place in the JD Power owner satisfaction survey. Launched in the UK in early 1999 and in the US in November 1999, the XKR Coupe or Convertible features the 370hp supercharged, twin intercooled version of the V8 already used in the XJR sedan. Very little was done to differentiate the cars. The only exterior differences are : red background badges, 18" wheels compared to the XK8 17", a mesh grille instead of the horizontal bar, twin functional louvers on the bonnet and a small boot lid spoiler. In addition to the supercharged engine, the XKR is equipped with a special Mercedes 5 speed automatic transmission. The additional 80hp and wider torque range, transform the car into a true high performance car with superior handling characteristics. As the fastest road going Jaguar ever produced, the XKR steps in the league of Porsche 911, Corvettes, and other exotics. All for a price which while not exactly cheap and affordable, is reasonable considering the performance. The XKR is often compared to its corporate cousin, the Aston Martin DB7, in part because of their styling and performance level but the XKR retails at a cost that's almost 40% less. This special limited edition of the XKR was created by Jaguar to celebrate its return to competition with the Formula One team. Named after the famous British track where Jaguar experienced so much success it shares the same drivetrain as the normal XKR. In addition to badging and special inside trim, the difference comes in the handling department with 20" wheels, lowered and stiffer suspension with beefed up antiroll bar, and larger crossdrilled Brembo brakes. Most of these where developed for the XK180 concept car and are available in Europe as dealer installed option under the R performance Option designation. As of October 2000, they are expected in the US but not available yet. 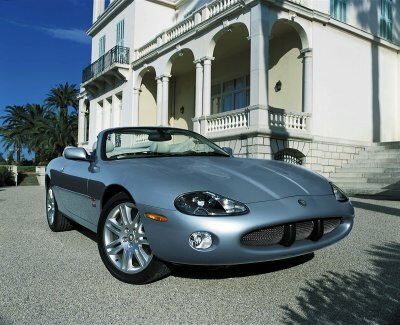 Production wise, Jaguar originally announced a limited run of 50 convertible and 50 coupes for the home market in march 2000. Later on, another series of 200 ( 175 convertible and 25 coupe ) was announced for the US market and started arriving at dealership in October 2000. While MSRP for the convertible is close to $ 100 000, most if not all dealers are actually asking well over sticker due to the limited production. 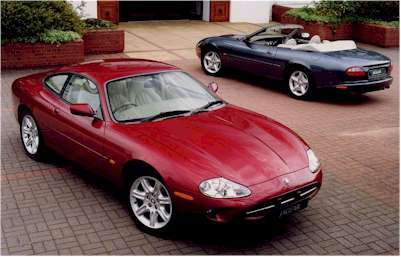 After the limited edition 2001 XKR Silverstone, Jaguar unveiled the 2002 XJR 100 and XKR 100. Both high performance cars, available only in Anthracite Black are named to celebrate the centenary of Jaguar founder Sir William Lyon. Both cars, powered by the same 370 hp supercharged V8 found in standard R models, come equipped with R options including wheels, brakes and suspension; the wheels are new BBS 9 spoke alloys. Jaguars Computer Active Technology Suspension first introduced on the XKRs will be standard on the XJR 100 saloon as well. The interior features Charcoal leather with a new R option steering wheel and shifter know. 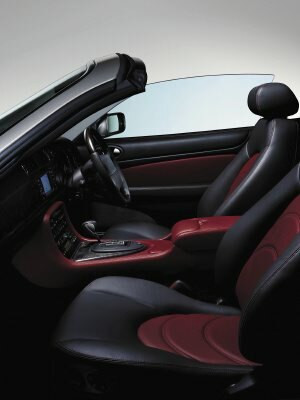 The XKR 100 also features additional aluminum trim including sports pedal, and special Recaro performance leather seats. Only 500 XJR 100 and 500 XKR 100 ( coupes and convertibles combined) will be available worldwide. As expected following the introduction of the new 4.2 litre V8 in the revised S-Type, Jaguar announced some significant improvements on the 2003 XK range starting with a new drivetrain. The new 4.2 Litre V8 is not just larger than its 4.0 predecessor but it also has been heavily modified (see list below). Power is now 300hp DIN in the base version found in the XK8 and a massive 400hp DIN in supercharged trim which comes to about 393hp SAE. The 5 speed automatic transmission is now replaced by a new 6 speed ZF providing closer ratios with the same silky smooth shifting. Jaguar thankfully kept its trademark J-Gate, slighly improved as well, which provides semi manual control of 2nd thru 6th gear. Top speed is still electronically limited to 155 mph and acceleration remains unchanged with the XKR coupe reaching 60 mph in 5.2 sec. and 6.1 for the XK8. Electronics have also been modified and enhanced including revised dynamic stability and traction control, revised CATS ( Computer Active Technology Suspension ), emergency brake assist, adaptive cruise control and more. Inside the car, the dash and console is unchanged except for new 12 way power seats and a new sporty leather shift knob. The unique and elegant wide veneer dash is retained with deeply sunken primary instruments. The seats are now available with contrasting leather. Outside, with such an elegant design there was very little to improve and the only differences are Xenon headlights, badging and new wheels. In addition to the R Performance options ( handling and wheels) a new 'Aluminium Pack' is now offered comprising instrument bezels, J-Gate surround, door release levers, pedal pads, tread plates, and all-leather steering wheel rims and gearshift knobs. Brembo Brakes previously optional are now standard on the XKR. - Capacity increased from 3996cc to 4196cc, with bore and stroke of 86.0/90.3mm (previously 86.0/86.0mm). - Naturally aspirated XK8 engine produces 300bhp (DIN)and 420Nm (310lb ft) of torque. Supercharged XKR produces 400bhp (DIN)and 553Nm (408lb ft)of torque, with more than 86 per cent of peak torque available from just 2000rev/min. - Eight cylinders in 90 degree vee, five main bearings, in naturally aspirated and mechanically super charged versions. - Aluminium-alloy block and cylinder heads for light weight in a compact package with maximum rigidity and strength. - Redesigned block and bed-plate make new engine even lighter and stiffer than original, further improving refinement. - Four chain-driven overhead camshafts operating four valves per cylinder with variable inlet and exhaust camshaft phasing. - Revised camshaft drive further reduces loads and already extremely low levels of radiated noise. - Valve clearances require no adjustment for life. - XKR uses belt-driven Eaton rotor-type supercharger with intercooling, now with helical rotor gears for low noise and coated rotors for maximum efficiency ­ both industry firsts on a production engine. 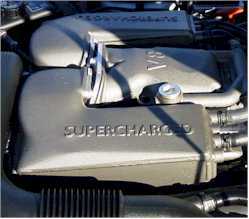 - Supercharger speed increased, and volumetric efficiency further improved. - Improvements to fuel-injection system further improves efficiency and reduces emissions. - Electronic Engine Management System features 'drive-by-wire' throttle action with 'get-you-home' facility. - Race-bred Brembo brakes now standard on XKR, optional on other models. - Dynamic Stability Control (DSC), Emergency Brake Assist (EBA) and Cruise Control standard across the range. Adaptive Cruise Control (ACC)is an option, and now features Forward Alert, an audible driver warning system that senses and responds to slowing traffic ahead. - Electrically adjustable steering column with entry/exit mode now standard on all models (memory optional). New equipment options include upgraded DVD-based navigation system and electrochromatic mirror with compass. - Range of new alloy wheel designs available as options. - Four new exterior colours: Jaguar Racing Green, Ebony, Midnight and Adriatic Blue. - New interior trim options include 'contrast ' finishes that feature Warm Charcoal contrasted with Heritage Tan or ranberry on sports style seats. 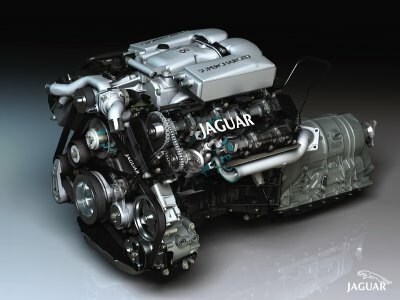 Jaguar's new AJ34 family of engines was developed at the Jaguar Engineering Centre at Whitley in Coventry. Designed to deliver more performance, better economy and improved refinement when compared with the original AJ28 AJ-V8 from which it has evolved, the AJ34 retains the same compact, 90 degree V8 dimensions but is structurally even stiffer. Capacity is increased to 4196cc, with bore and stroke now 86.0 x 90.3mm. With a ribbed block and cylinder heads, the engine is very light but extremely strong, its best-in-class stiffness minimising radiated engine noise and increasing mechanical reliability. The four-throw, six balance-weight crankshaft is supported in five main bearings and the connecting rods feature fracture-split big-end journals, for strength with light weight and perfect balance. Mechanical refinement is improved, reducing engine-generated noise and vibration even further. The four chain-driven overhead camshafts are 'rifle-drilled ' to save weight and improve performance. Revised camshaft drive sprockets and finer-pitch inverted-tooth chains further reduce the already-low radiated noise levels and mechanical load.The camshafts operate four valves in each pentroof combustion chamber, and direct-acting aluminium bucket tappets need no adjustment for the life of the engine.The unusually narrow 28 degree valve angle benefits both combustion chamber shape and overall packaging. The new 4.2-litre V8 benefits from continuously Variable Camshaft Phasing. A hydraulic actuator on each inlet camshaft is operated by a pair of electronically-switched oil-pressure control valves, activated by the engine control module ­ which contains maps of engine speeds and loads. The system continuously adjusts the phasing of the camshafts, from maximum advance to maximum retard in less than 0.7 seconds. The inlet timing is therefore optimised at all times,according to load and other conditions, to produce faster engine response and optimum performance at all engine speeds ­ with more torque at low speeds and maximum power at high speeds. It has the added advantage of providing internal exhaust gas recirculation, reducing NOX emissions by slowing down the combustion rate and reducing HC emissions by reburning the exhaust gases. With exactly 300bhp (224kW DIN)at 6000rev/min and 400bhp (298kW DIN)at 6100rev/min, the new engines are respectively 3.5 and 8.1 per cent more powerful than their predecessors. The improvements in torque are equally significant. Maximum torque for the normally aspirated 4.2-litre V8 is now 420Nm (310lb ft)at 4100rev/min, while the supercharged engine peaks with 553Nm (408lb ft)at just 3500rev/min. That said, 'peaks ' is hardly the way to describe the torque delivery from the supercharged 4.2­litre engine. The torque curve for the new V8 sits significantly above the equivalent curve for the previous 4.0-litre engine, but once again it is impressively flat across the whole of the engine's usable rev range. That includes at least 86 per cent of its peak torque all the way from 2000rev/min through to maximum engine revolutions. To match the increased output and the increased mechanical and thermal stresses that supercharging imposes, the new XKR V8 has stronger pistons,forged from single billets of aluminium alloy. It also features oil jet cooling on the underside of the piston crowns, for maximum cooling and minimum distortion. US Pricing hasn't been announced yet. In the UK the XK8 will carry on the road prices of UKP 48,700 (coupe) / UKP 55,350 (convertible) and the XKR UKP 56,700 (coupe) / 63,350 (convertible). That's an average of about UKP 750 above 2002 model prices. 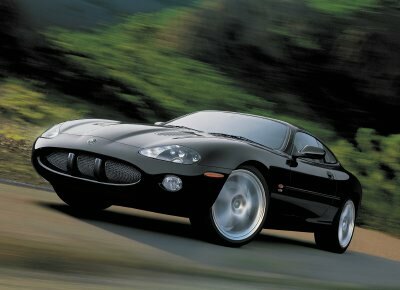 In 2005, the XK8/XKR would receive a final facelift with minor modifications to the body, particularly the front end giving it a slightly more agressive look. 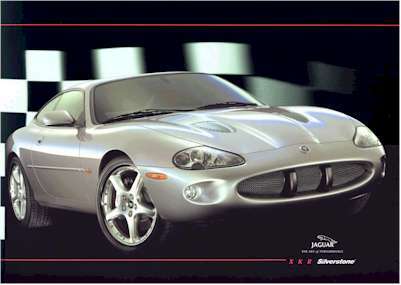 Visit our complete "New" XK page for detailed information on the Aluminum bodied 2007 XK ! With early models now reaching very affordable prices, XK8s and to some extent early XKRs can be very good buys. However, as with any car but particularly luxury high performance models, maintenance can be higher than anticipated. Maintenance records and a good inspection by a Jaguar specialist are highly recommended. The XK8 seem to have very little significant problems as early models reach high mileage although two issues can potentially be very costly. Until 2000, earlier version of Jaguar's AJ26 V8 engine used Nikasil cylinder liners and a number of engines had to be replaced because of high wear of the plating resulting in loss of compression and high blow by. High sulfur content in gas and infrequent oil changes contributed to this problem making it in some cases a regional isssue. Replacement engines use the same steel liners Jaguar uses in 2000 and up engines but replacement is obviously costly. A blowby test or compression check may be a good precaution when buying an early car.